The wet spring and following heat wave must have been just the right conditions to favor sedge growth this year. I have had a few calls concerning mystery weeds in lawns that turned out to be sedges. Illinois is home to many sedge species and several are featured at www.illinoiswildflowers.info/. Simply search for "sedge" at that site. Although the sedge (Cyperaceae) family contains many, many members, the most commonly found weedy sedge in Illinois lawns and landscapes is yellow nutsedge (Cyperus esculentus), also known as yellow nutgrass. Life cycle and appearance. 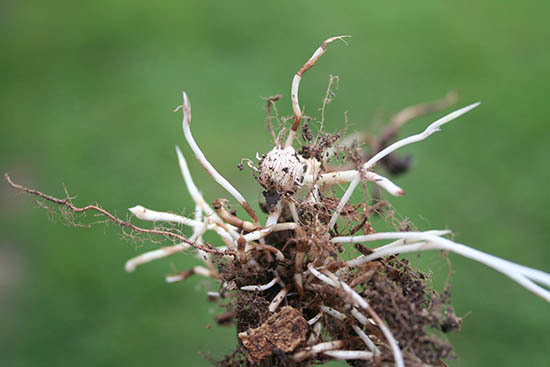 Individual yellow nutsedge plants have upright, grasslike leaves that emerge from a fibrous root system, and scaly, white or light-colored rhizomes. The base of the plant is distinctly triangular in shape – "sedges have edges". Grasses have round or oval shaped stems. A warm-season perennial, one yellow nutsedge plant may produce hundreds or even several thousand tubers in a season. The tubers develop rapidly six to eight weeks after the plants emerge, usually during late July and August, and can persist for many years in the soil. Forming at the ends of rhizomes (not in chains as occurs in other sedges such as purple nutsedge), the nutlets can reach up to 4/5 inch in length. Most tubers can be found in the top 6 inches of the soil and a chilling period is required to break dormancy. New plants emerge from tubers from late May to mid-July. Leaves emerge from the plant's base, are three-ranked, grasslike, and light yellow-green, 1/8 to 1/2 inch wide, up to three feet long, and have parallel veins with a prominent fold in the middle. The upper surface of the leaf is shiny or waxy, and the lower surface is dull. Nutsedge leaves grow rapidly during summer; they often grow above the canopy of cool-season turf. Nutsedge inflorescences (flowers) are flat topped and multiple branched with long, leaflike bracts beneath. The inflorescences resemble burrs and occur at the end of a stout, triangular (in cross-section), yellow-green stem. Each branch of the inflorescence is composed of multiple yellow-to-golden brown spikelets, each up to 1-1/4 inches long. The inflorescences appear July to September during 12-to-14-hour days. Ecology. Yellow nutsedge is often an indicator of poor drainage. It grows on all soil types, especially wet or moist sites or sites receiving heavy irrigation. It usually appears on soils with a pH of 5 to 7. 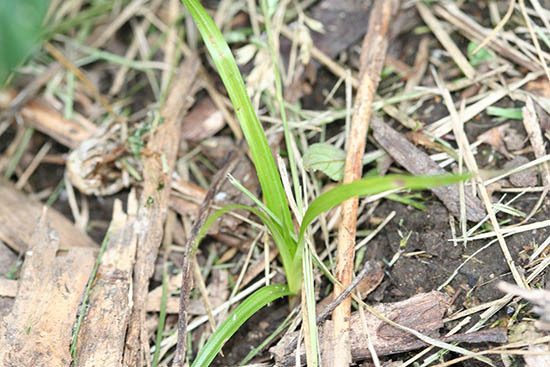 Yellow nutsedge does not tolerate shade and will tolerate dry sites once it is established.